The community was originally known as May Apple Springs for the abundance of that spring blooming plant. The name change occurred with the opening of the post office in 1884. 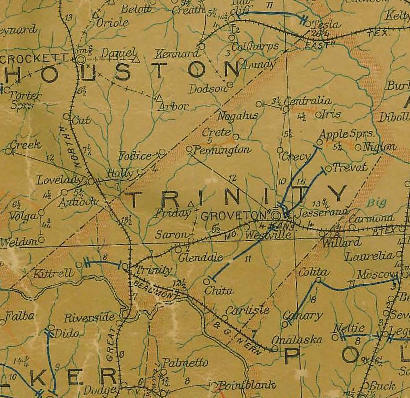 The town moved to be closer to the railroad (the Groveton, Lufkin and Northern) and in the mid 1910s – the town reported a population of just 75. The railroad became a victim of the Great Depression and in 1931 the town (population 150) moved again – to relocate alongside the newly paved highway. It has remained there ever since. In the mid 1960s Apple Springs had a population of 285 – declining to the 130 estimate in the early 1990s with nine business. According to the Handbook of Texas, the year 2000 reported a population of 185 with twenty-one business, although the official 2017 TXDoT map still shows 130 estimate.